The death of Margaret Thatcher is an important event for anyone who stands for equality and socialism. While the event itself changes little, and Thatcher has not been in power for over 20 years, the legacy of the ‘New Right’ is still making people suffer today. Coming to power in 1979, Thatcher followed a vicious campaign that saw millions of people condemned to suffer unemployment, the unions attacked and the demands of the workers ignored, more troops than ever sent into the north of Ireland and Irish republican leaders assassinated and arrested, a jingoistic war enacted that served only to strengthen the hold of the Argentinean Junta. All of this in order to funnel wealth to the rich. 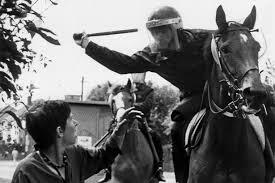 Thatcher called the miners the ‘enemy within’ because they dared to strike against job losses. The miners’ defeat – with several strikers dying and hundreds being arrested or imprisoned during their heroic year-long battle with Thatcher – led to an all-out assault on the rights to organisation, living standards and conditions of workers in Britain. 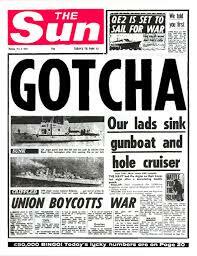 British media gloating during the Falklands war. Unions stand opposed. She claimed that there was no such thing as society. The legacy she left still holds sway today. Unions in Britain are still held to draconian strike laws, the north of Ireland is still under occupation, the rich are still permitted and encouraged to take everything they possibly can. Ed Miliband, the current leader of the Labour Party, claims that ‘Thatcher had a lot of things right’. It is this legacy that is the reason socialists should mark her death with celebration. It may be decried as ‘vulgar’ by the media, by reformist politicians, but it is important. Thatcher left office in disgrace, booted out by her own party when her regressive Poll Tax caused riots across the country. Now, they are attempting to turn her into a hero. Politicians all across the world are calling her a ‘strong person’, saying that she stood for freedom. These lies show a flagrant attempt to rewrite history. Those on the left should not allow this to happen without a fight.